'Should you ever find yourself in need of some explanations as to why Scots are the way they are. Why Scotland looks the way it does. How the geology of the country is as important to the history of the country as the lists of tartan clad nobility might be. Why the profundity steeped in a pseudo simplicity gifted to us by Hogg ,Ferguson,and Burns,marches inexorably foreward in a culture which seems to be able to weather the most intolerable strains impressed on it by modern media types. If you have a desire to luxuriate in the most beautiful use of the English language borne along by the love of one gifted poet for a recognized master of melancholy, then this is the book for you. It most certainly is the book for me'.........Billy Connolly. I have long admired the work of Greig. He is among the best contemporary novelists, combining page-turning readability with profound insights into the human psyche. He is an award winning poet, and has written several works of non-fiction. Greig describes his journey to Lochinver, his meeting with Norman MacAskill and his and his two friends’ attempts to catch trout at this remote Assynt lochan, all presented in a day by day journal, including their encounter with a local policeman who tells them to get a fishing license “next time”. He also his return to the lochan in 2008, this time alone and with the fishing license. However, this is far more than an account of his attempts to catch fish. It is a history of the area (and indeed Scotland) from what he calls “deep time” through the Clearances to the successful land buy-outs. It is also a highly poetical, beautiful and at times tragic soliloquy on his own life and on the lives of those around him. In order to achieve this within the narrative, he has divided each chapter into short sections taken from angling terminology: alternating between Cast – in which he describes the progress of the expedition, and Retrieve – in which he looks to the past. He also describes conversations with people who knew MacCaig, presenting him as a generous man but one who was as capable of irritating people as he was of inspiring them, and who didn’t suffer fools gladly. He apparently got into various scrapes, particularly after a dram or three too many. The book also contains some previously unpublished poems of MacCaig’s, as well as one of Greig’s own poems. He writes of his various mountaineering exploits, and of times he almost died (and of friends who did lose their lives on the mountains); of his attempted suicide and of his recuperation in a mental hospital; of his difficult relationship with his father; of the break up of his first marriage and of finding happiness with fellow writer Lesley Glaister; and lots more. After he left his first wife, he tells of sharing an Edinburgh flat with an American called Don, who was a gay rights activist who recognised immediately that Greig was straight. He describes later visiting Don in San Francisco, and meeting Don’s partner, Larry, who hadn’t been well, but nobody was sure what was wrong with him. He explains how months later, he got a letter from Don, explaining Larry was ill with a disease that now had a name: Aids. Eventually Don died with the same condition. All this may seem a long way from fishing among the spectacular hills of Assynt or from the poetical and drinking exploits of MacCaig, but it isn’t. Just as all we experience can be found in great poetry, so can it be found in the beauty of the natural world. Greig’s great achievement is to help us appreciate that. 'It is in part because he looks for a place where they do things differently that Greig is drawn to Assynt and some of the best of this fine book is taken up with attempts to face down his tendency to reify glimpses of the ideal... It's Greig's habit to set literature aside in favour of life but the rich contradictions involved in doing so require him to exercise all his considerable art' --Guardian. 'Moving and richly written about life's great adventures' Greenock Telegraph. 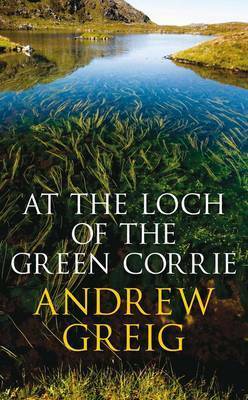 'At The Loch of Green Corrie is more than merely elegant, more than a collection of albeit fascinating insights, laugh-out-loud observations and impressively broad erudition. Greig manages to give his holiday journal a definite narrative tension' Sunday Herald.